The scribes of Anglo-Saxon England copied books on scientific as well as religious subjects in the expansion of learning that had begun under Alfred the Great and continued, fed by increasing contacts with the continent, through the 10th and 11th centuries. This is a copy of one of the most well-known scientific books of the day, 'On the nature of things', on physical science, by Isidore, bishop of Seville, who lived in the late 6th and early 7th century. Written in an elegant script (style of handwriting) which was based on Carolingian styles, the small book is illustrated with diagrams labelled with capital letters in a style that looks back to types of Roman handwriting. 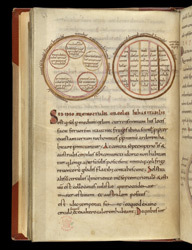 Most medieval copies of 'On the nature of things' include diagrams of some kind. In a section on the climatic zones of the earth, Isidore speaks of the 'orb of the earth', citing the ancient Greek philosophers and indicating medieval knowledge of the earth's spherical shape. The diagrams illustrating the section, however, show the zones as small discs within a larger disc with the cardinal directions indicated around its edge (left) and as vertical divisions of a circle. In the second diagram, the zones are placed with the coldest at the 'poles' (although sideways) and hottest at the equator, with the inhabitable temperate zones between.